This is Part 4 of my z650 restoration work. It is now 2017, the z650 has been a great bike but there are a few issues that need to be dealt with. Partially to complete it and to keep it running. Work Needed to Finish the bike. I’ve tried to keep the bike as complete as possible, so cosmetically it still has the original spokes, rims and hubs. it also has an original 4 into 2 exhaust system which came of my other z650 and is a bit battered. The starter clutch has recently failed after a few years of slowly showing signs of deterioration. The clutch plates need to be removed and checked. The clutch cush drive rubbers are most likely stuffed so this needs to be addressed as well. The compression is low so the rings may need doing. It needs a new kick starter, the original one is worn but the spline shaft coming out of the engine looks ok. I plan to fix the starter clutch so it starts first go and check the clutch plates so they are in service limits. The clutch basket will be an on going issue and as I have another z650 B1 model with the engine out I will use it as a test bed first to replace the drive rubbers (I bought 2 kits so all good). Some time in the near future I will purchase some rings. I will research this then pull the motor out when I know exactly what size rings I need. Cosmetically I need to redo the paint work and fit side cover badges. I also need to replace the headlight rim. If I’m really keen I could redo the chrome on the rims and replace the spokes with stainless as well as blast and paint the wheels hubs so they are original looking. 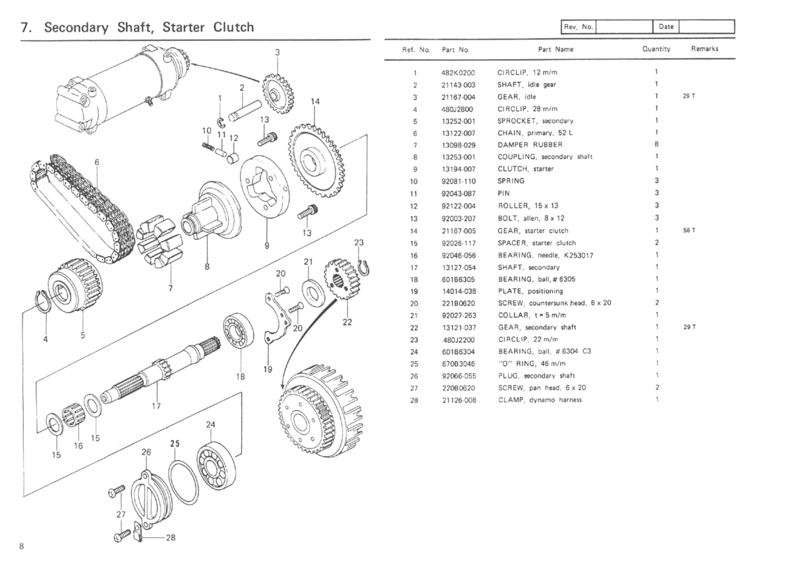 Starter Clutch – I don’t plan to remove the engine at this stage so I will have a crack at getting to the starter clutch with the engine in the frame. Tutorial to follow shortly…. very shortly! June 2017 – After a period of hibernation I’ve restarted working on bikes! I ordered and have in my possession the starter clutch springs, scheduled to be done this weekend.